Whether kid or adult, you’re never too old for a bean bag. Sit back and relax with our range of alternative furniture choices. Whoever said bean bags belong in the 90s? Bean bags are actually highly underrated in terms of comfort, and don’t just belong in children’s bedrooms either. The Man Cave is a space that has evolved over recent years, and quite frankly, wouldn’t be complete without the designated bean bag chair. There are now also a range of cosy bean bag chairs that make a great alternative to traditional furniture in rooms such as lounges and conservatories. Unlike other types of seating, a bean bag is a big blob of cosiness that moulds to your body shape for the most comfortable seat in the house. They are perfect for chilling with a book, watching movies, gaming, or taking a cheeky afternoon nap and are far more luxurious that what they once were. If you have just become a parent and have a little newborn who needs constant attention, bean bags are a great, comfortable way to cosy up next to you little one in their moses basket. Make sure you think about how you will use your bean bag before you buy one. They can be quite pricey, so be sure to think about whether your bean bag will be thrown around by the kids or be used by grown ups only. If the kids are likely to be the predominant users, wipe clean fabrics are a must. Likewise if you picture using your bean bag outside in the summer, a sturdy hardwearing nylon fabric is a necessity. However, if you are in the market for a bean bag that adds a touch of luxury to a bedroom or living room, check out the fur bean bags in our list below that add a bit of texture and softness to any room. 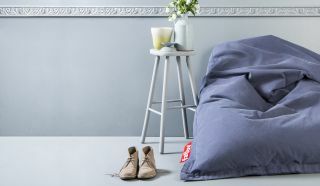 So if you’re looking for the ultimate cosy addition to your home, then have a browse of our top picks for adult and children’s bean bags that are both stylish and functional. If you’re a gamer, then this is the ideal addition for your man cave or lounge. For those whose partners don’t want the living space to be taken over with tech stuff, this chair blends in as part of the furniture with its faux leather finish and neutral colour choices. It makes a great additional seat in any room of the home and doesn’t take up too much space. This faux fur bean bag is the ideal seat for chilling on a rainy afternoon with a book. It would look great in any bedroom, lounge or conservatory and gives a warm and cosy feel to the room. It is moulded into a seat shape which provides ultimate comfort along with its stylish look. This Fat Boy Bean Bag is the ultimate man cave accessory. With a wide choice of colours, you’re bound to find one that suits your room’s décor perfectly and it is the ideal way to chill on a lazy Sunday. You can mould this bean bag to your most comfortable position for a seat you won’t want to get up from. The beans get quite warm when sitting on them which make this bean bag extra cosy. If you like the look of the Icon Soho Fur Bean Bag but not the hefty price tag, then this faux fur bean bag is a fraction of the cost but just as cosy. It is a little smaller which makes it perfect for bedrooms and for additional seating in your living room. If you have pets, this could also make a cute little place for your puppy or kitty to take a nap. The Stompa Uno S Plus Quilted Bean Bag is the perfect portable seat for kids both indoors and outdoors. It can be moulded into an upright position for activities such as watching TV or ready, or flattened down so you can relax outdoors in the sun. It comes in a choice of colours guaranteed to look great in your children’s bedroom. This bean bag is basically a big furry sofa which would look great in a lounge or conservatory with a shabby chic décor. It can also be moulded into a more traditional bean bag shape which makes it suitable for bedrooms, too. Although pricey, if you are looking for a statement piece of furniture that isn’t too ridiculously expensive, this bean bag is a great modern idea for the home.